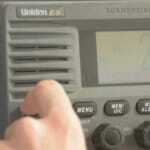 USCG Local Notice to Mariners (LNM) - What is it? 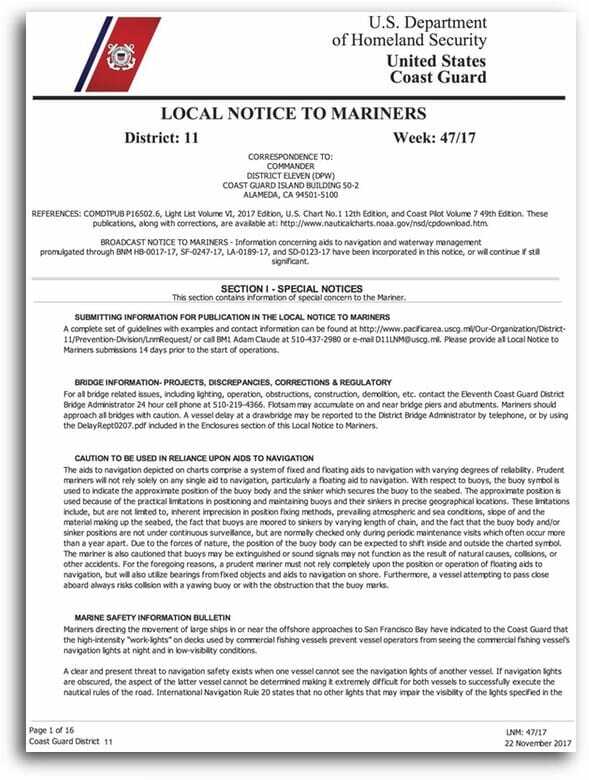 Ah, the Local Notice to Mariners… Most of us know about it, but many of us don’t really check it out and still others have never even heard of it. For the latter group, the Local Notice to Mariners is a document that gets regularly published by the U.S. Coast Guard (weekly), letting us know about stuff that gets changed on the charts (“discrepancies”), advanced notice of things that are going to be coming down the pike and it also brings us up to speed on situations that are happening in our local waters. 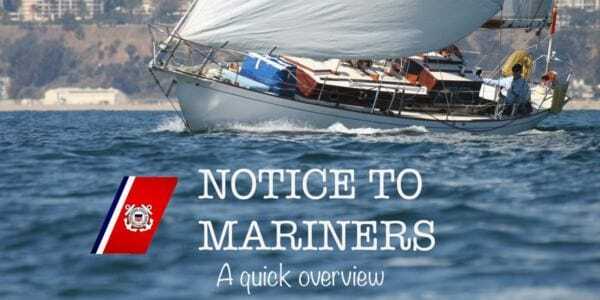 At first glance the Local Notice to Mariners (LNMs) seem pretty dry and boring. There are pages of abbreviation translations, forms to report drawbridge closures (and other admin type supplies), announcements for public comment, and public notice documents published to ensure people are up to date with often mundane happenings like local construction work. However, scratching below the surface there’s lots of interesting material in the LNM. These official notices are separated by districts across the United States so local sailors may have to dig a little for information that pertains directly to them. The good news is that this digging can be pretty interesting. 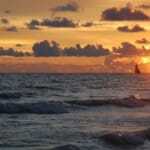 It’s intriguing to see what’s going on in and around wherever you sail your boat. For instance you might learn that 40 miles away from your place in the sun the U.S. military is testing their most powerful weaponry or there’s a submarine pipeline near where you are or maybe, like in the case of Southwestern Alaska, there is a volcano erupting… which you may want to stay clear of. Up in Northern California (District 11) the Monterey Bay Aquarium is testing “liquid robots.” It’s not written like a summer blockbuster but that’s kind of interesting, not to mention something sailors should know if they plan to sail around that area. Another example that carries a little more weight is from District 13. Obviously if you are relying on your GPS and it starts acting “wonky” it would be nice to know that it might not be the electronics on your boat and you might want to be prepared to use alternative methods of navigation should the need arise. But beyond the fun of just looking for the extraordinary for entertainment purposes, it really is prudent to consult the Local Notice to Mariners. The United States waterways are a busy, ever-evolving sub-universe that we, as sailors, need to stay up to date on if we’re going to venture beyond the harbor. There are often changes in buoys (locations or removals), notices of new obstructions, warnings about areas that must be avoided and addendums to what you may be counting on as solid factual information by virtue of it being there, in black and white in the charts. So, definitely make checking the LNMs a habitual part of your sailing behavior. It’s good safe practice and also quite fun and interesting. You can find the Local Notice to Mariners for your district on the US Coast Guard Website 〉&rang.